St Bloggie de Riviere: Fat French Pikey Alert! Before I get wittering pour de vrai, may I just welcome my 100th member to this blog. Lovely people all of you. As you're all paying attention, could I mention that I've been nominated on the old Expat blog awards (see blue thingy on the right), and happy comments about my blog would be most appreciated. No pressure, and it really is no big deal in the grand scheme of things, but if you've got nothing better to do, then please pop over, here's the link. Anyway, there I was standing waiting for the class to start, minding my own business when three Frenchie friends come along to take up action stations. Two filled in the gap between me and the zumba instructor. The third, the afore mentioned FFP stood next to them, slightly to my right and in front of me, totally invading my space being about 20cm away from my body, and totally ignoring my very close presence. I was gobsmacked, and ahemed a couple of times, you know, to let the stupid cow know I was actually there and she was practically standing on my head. I could have spat on the back of her neck and had no way of missing, she was that close! In the mirror, my friend was watching her face, and was amazed to see a look of sheer hatred and determination fix itself onto her pikey mug. One of her friends noticed how incredibly close she was to me and tried to pull her over a notch. The immovable force binding her to the floor yielded a tad and she shuffled a couple of centimetres to her right. I could now breathe freely, especially as I was standing more up wind. Then the class started. It was obvious she knew many of the steps, not that the years of zumba showed too much on her physically, and she was very enthusiastic with her wide stepping and arm flinging about (I think she was trying to tell me something). She also kept blocking my view as she was often standing just ahead of me and, surprisingly enough, I couldn't see either through her or around her, especially the not inconsiderable distance round. In the end I gave up and moved backwards. Life is too short to be trampled by an irate Fat French Pikey because I stood in her spot. Some people are very possessive of 'their' spot in a public place - they always sit at the same table in a canteen or the same chair in a lecture hall, and get upset if someone has the affront to deprive them of their little comfort spot. I frankly hadn't noticed in previous classes that she always stood there though. I'm not sure I'd actually even noticed her presence at all to be honest. 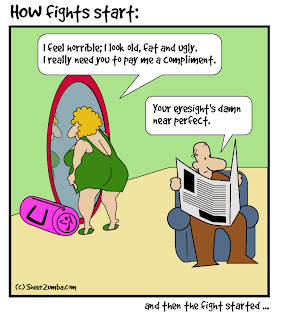 Without my glasses certain (pikey-type) people tend to merge into a blur of short fat mediocrity. It would have been a mistake, I'm sure, and a dumb way to die if I'd come to a sticky end because she lost her footing, sat on me and squashed me to a pulp. Even dumber than the dumb ways to die in this delightful Australian video that in fact promotes being safe around trains. I hate the way some people claim "their" space at any regular gatherings - it's so pathetically childish, it reminds me of old people's homes! At least the oldies hAve the excuse of advanced age and dementia, what's her excuse?! I agree and think it's great to take their space sometimes just to wind them up! OMG what a DARLING video: thanks for sharing lolol, and yes it would be a dumb way to die, heehee. You're welcome, Kassandra. :) It tickled me too. I think I'll stay at home and exercise in peace! Just done my bit too - in fact I think I've left two comments on the Expat thing. Good luck! Yes the exercise thing - in my dance class there are those who stand front and centre and woe betide anyone who tries to stand in their space. Thank you very much Jody, I feel like that about your blog too. It's funny how playground behaviour carries on into adulthood. I hate space invaders! Good on you for resisting the urge to push and kick her. It can only imagine the inner struggle. And by the way, Fat French Pikey Alert, has to be the best title in the history of blogging. Haha, thanks Sara, I did wonder if it was a bit strong, but liked the sound of it so much I overcame my worries. What would we do without Zumba ? That said, it could have happened anywhere! Absolutely. Being rude is not exclusive to this local lass. Found my way here via the Expats award blog, and delighted to have found your blog. You get my vote! I'm not brave enough for zumba, but I have the same issues with two girls I call the "pool princesses" who motor with their way down the narrow section of the local pool with their float boards, side by side, tutting at anyone going in the opposite direction. I enjoy swimming between them so that their nasty gossip gets interrupted. Thanks, MM, and welcome. Also thank you for your lovely comment on my Expat Blog thingy. Have left a little message for yours too have been over to have a browse on yours. Or you can Follow with your Google account.